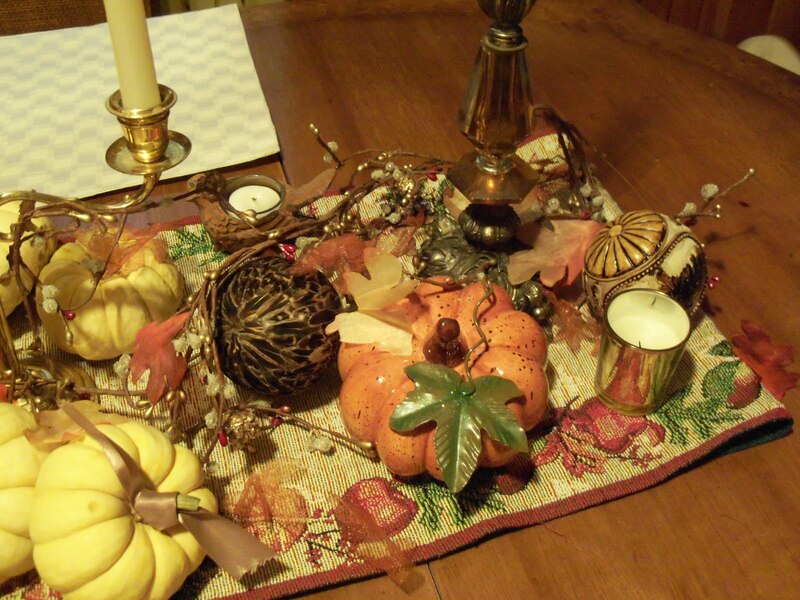 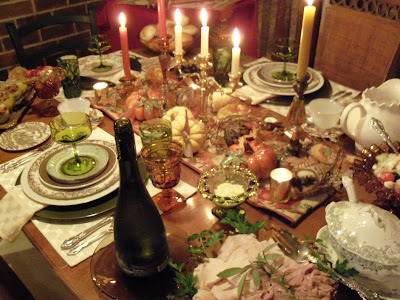 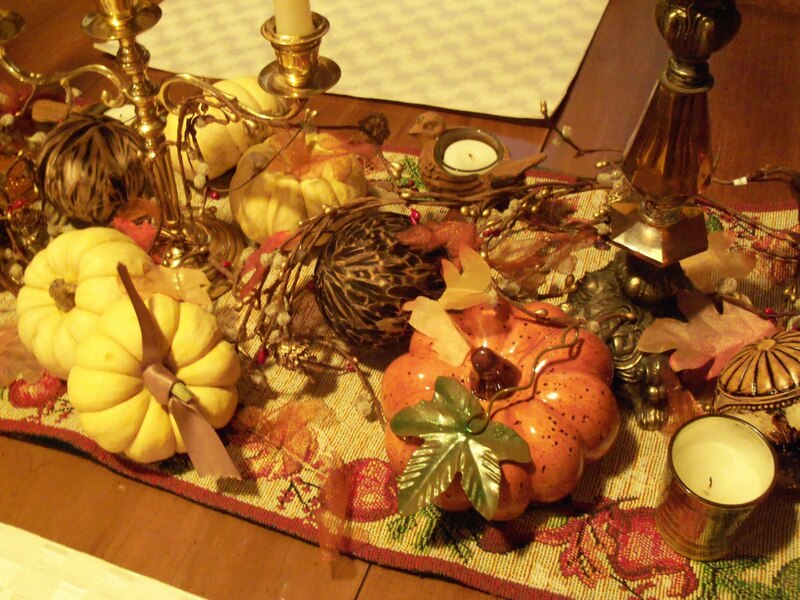 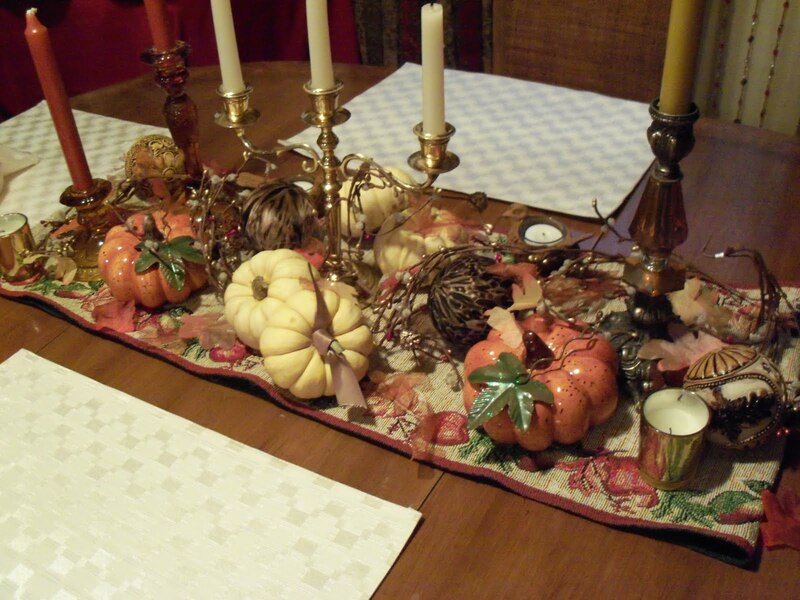 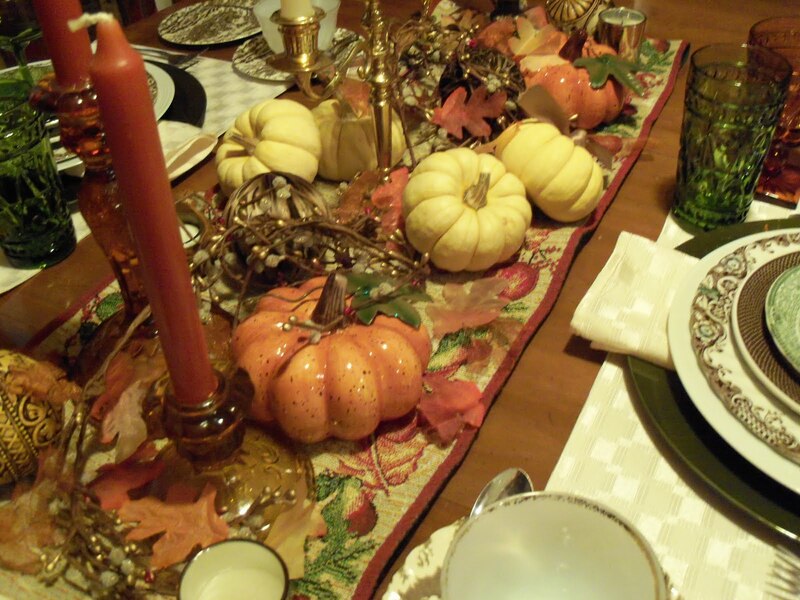 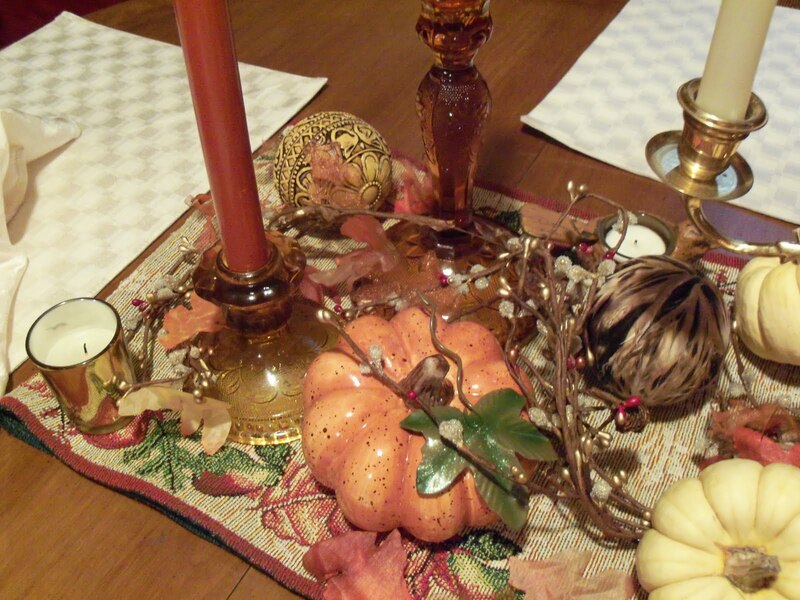 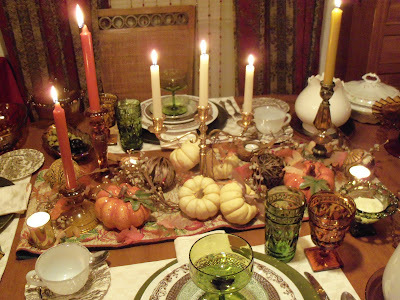 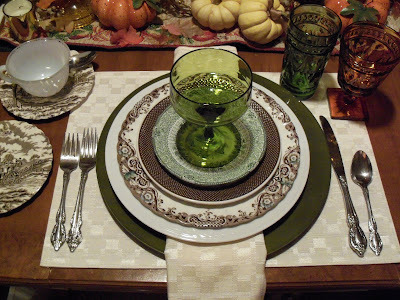 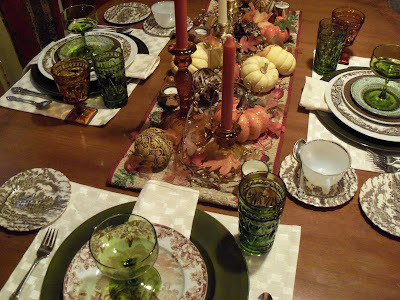 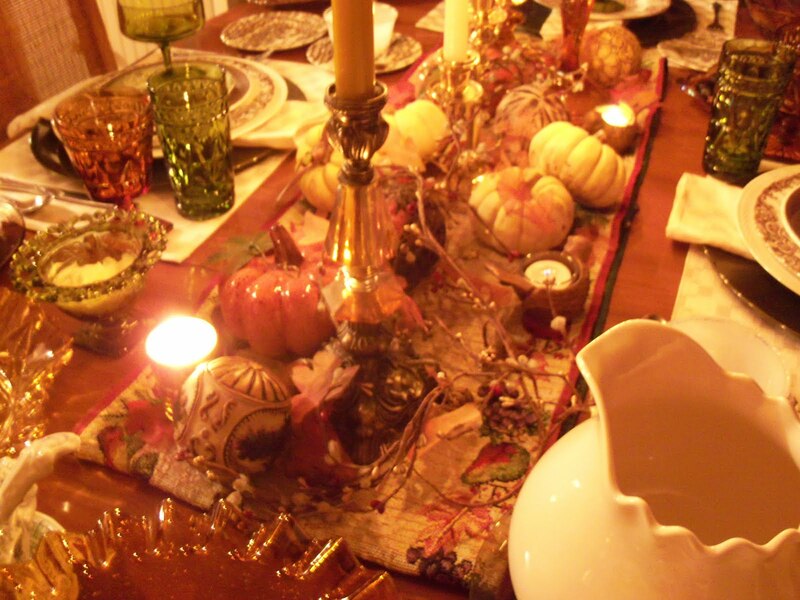 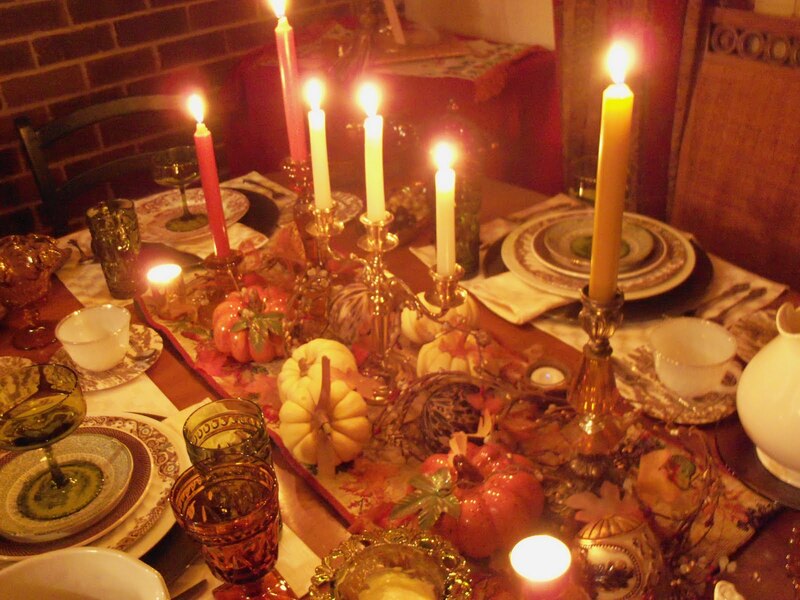 I know most of you who participate in Tablescape Thursday posted your thanksgiving table last week. I decided to wait until this week because I shut my computer down for the holiday and just enjoyed the day with my family. 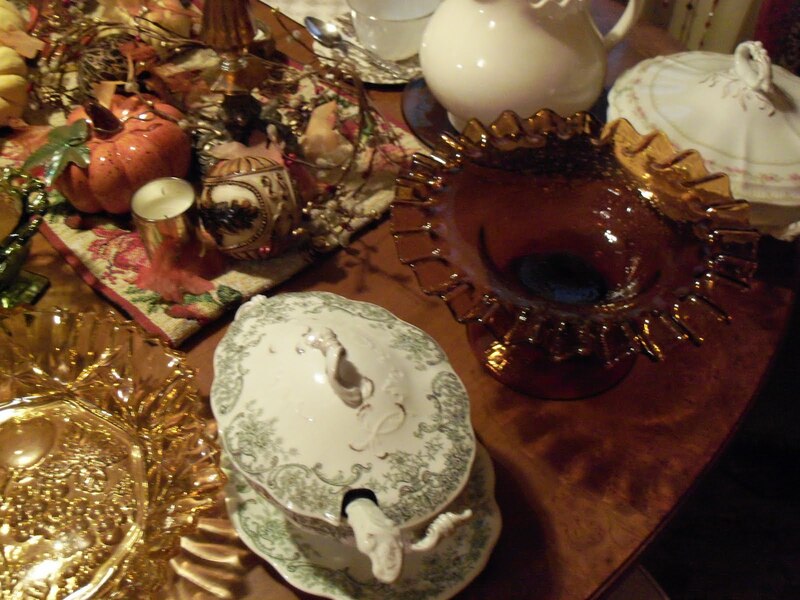 After looking at my pictures, I realized that everything on this table was thrifted 2nd hand or bought new but clearanced with the exception of a couple of small Dollar Tree decorative items. 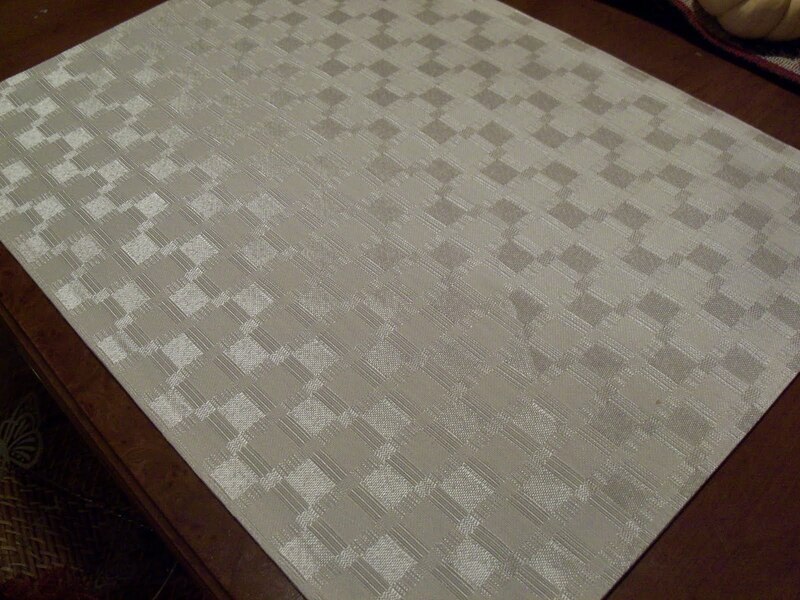 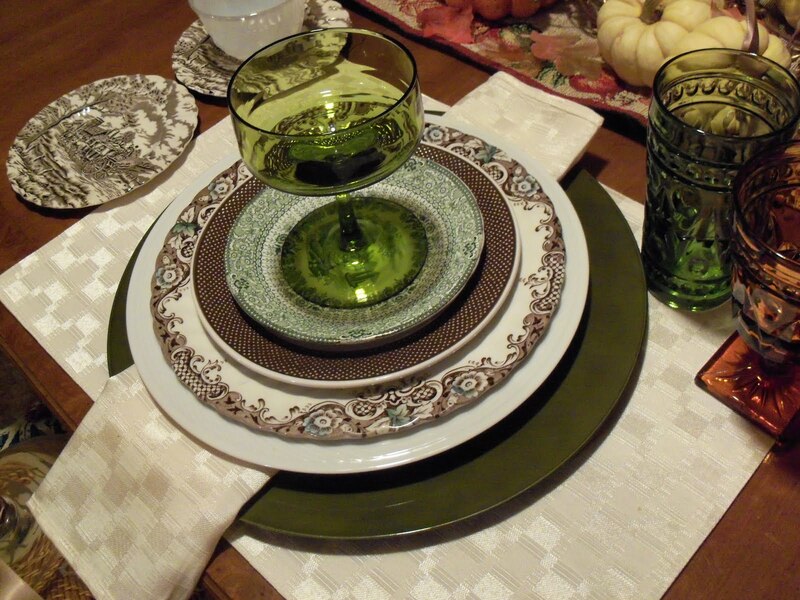 Pretty ivory place mats bought last year at 75% off for a set of 4 mats and 4 napkins at Walmart. 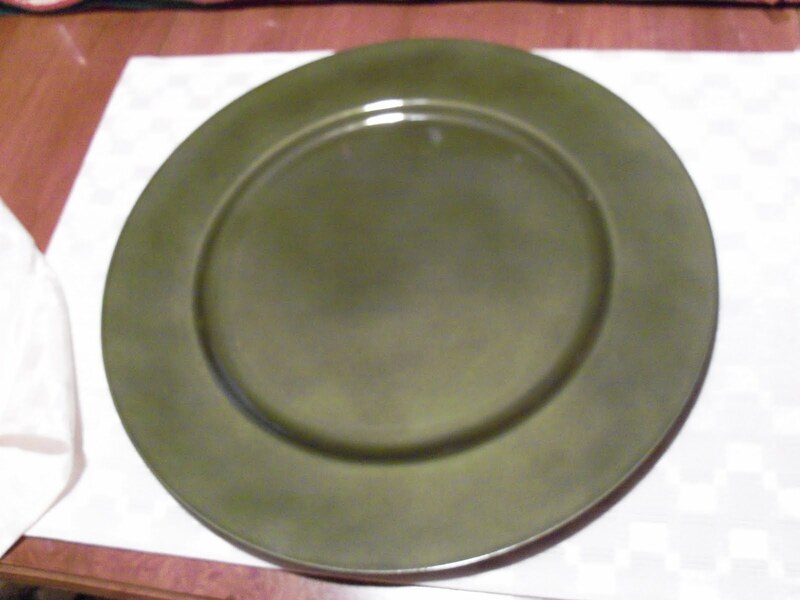 Mossy green chargers bought at Target after Christmas on clearance 75% off. 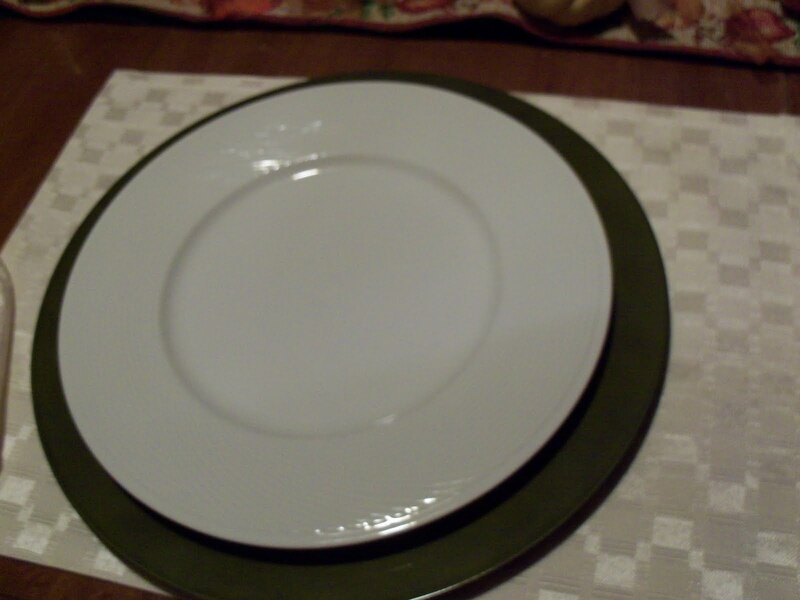 Plain white dinner plates. 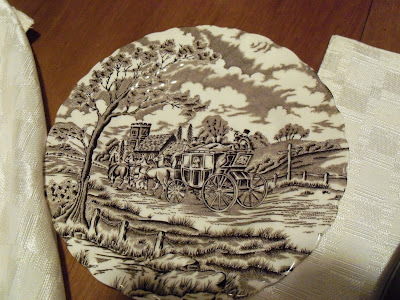 Bought 2nd hand at a thrift store a long time ago. 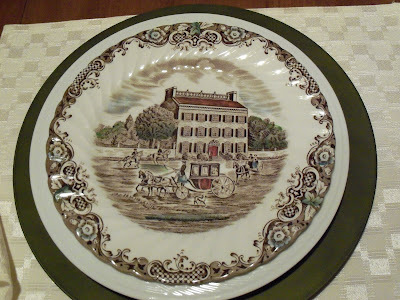 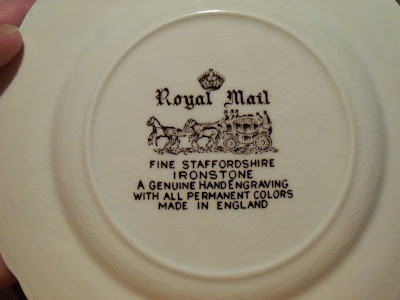 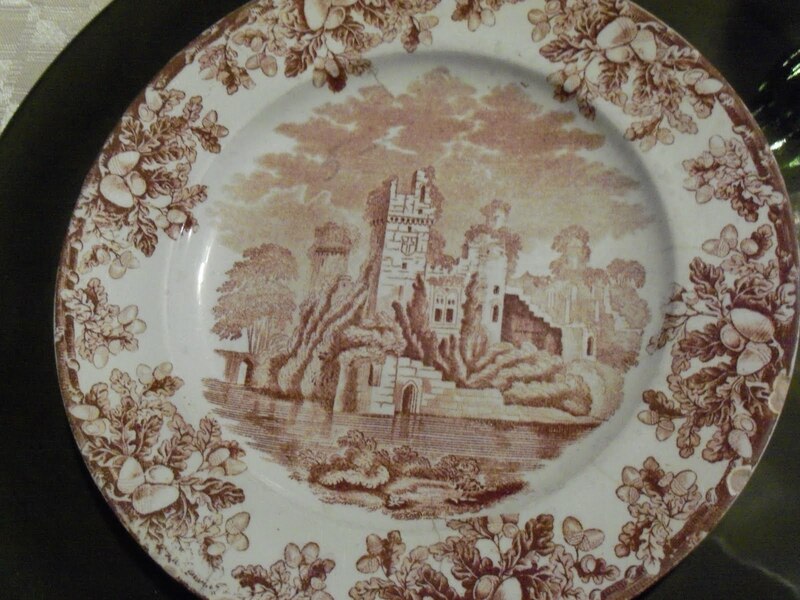 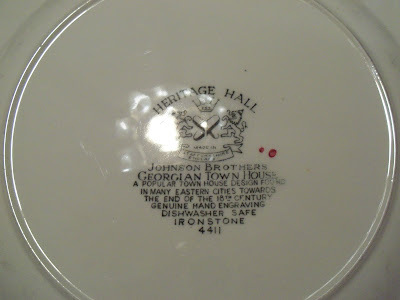 Johnson Bros. ironstone dinner plates bought 75% off after Thanksgiving last year at TJ Maxx. 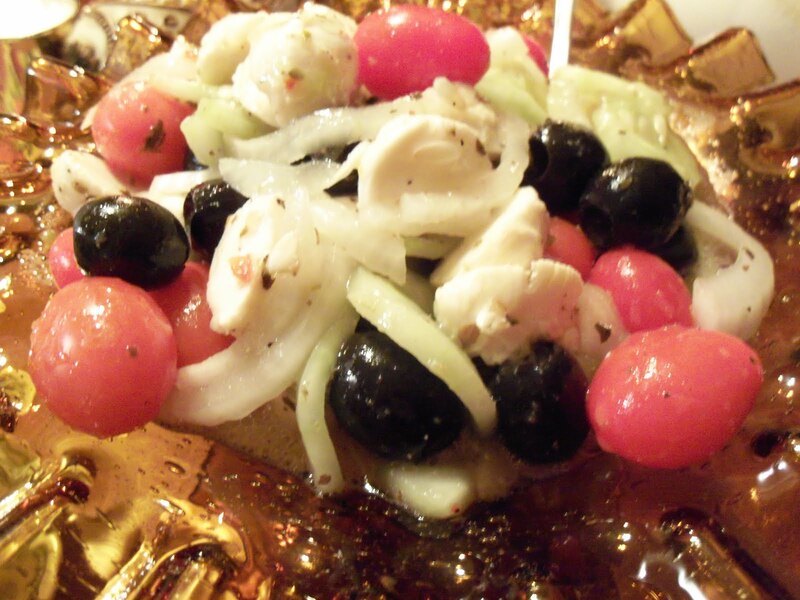 The salad plate is from a set I bought last year at a thrift store. 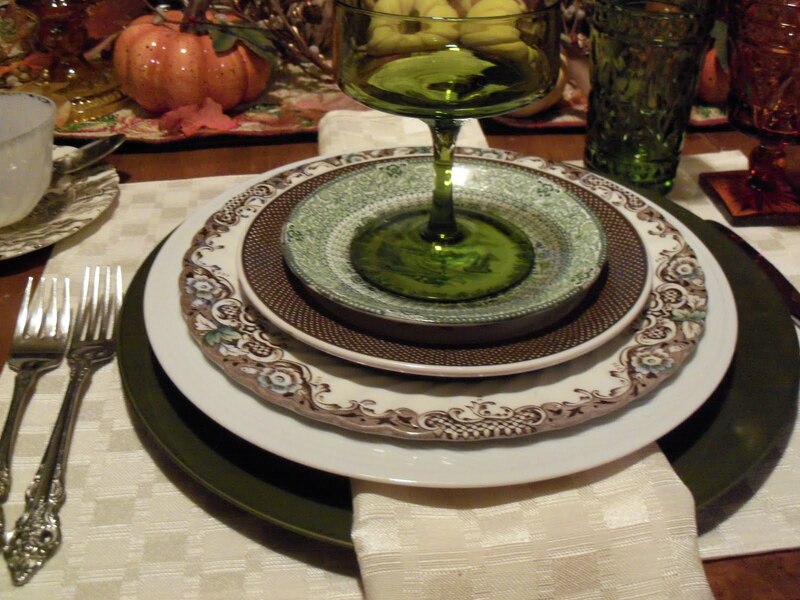 I didn't really care about the design in the middle. 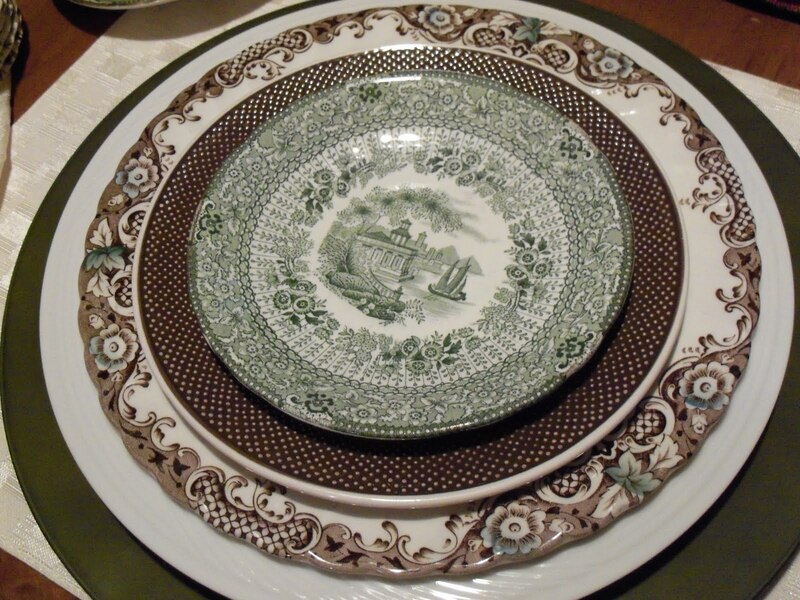 I just knew that the out edge in the dark brown and white dots would be beautiful in layering dishes. 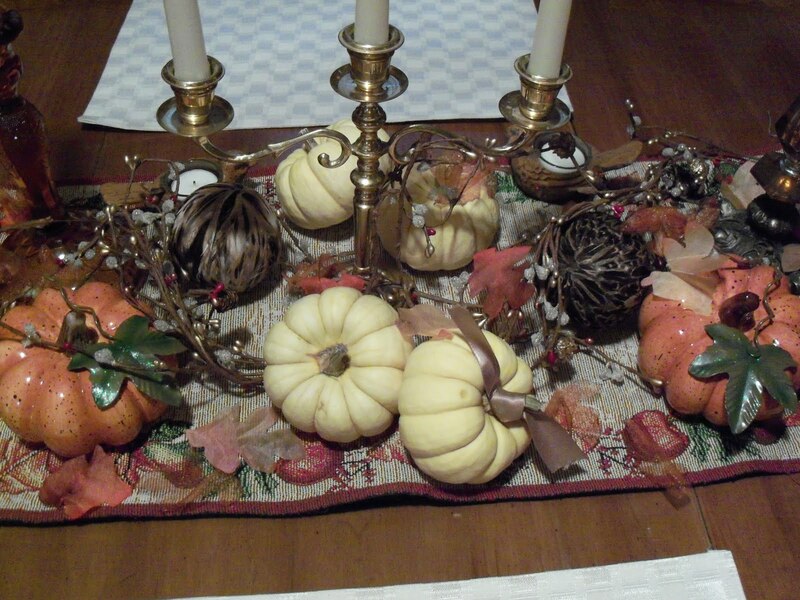 The set was from a thrift store. 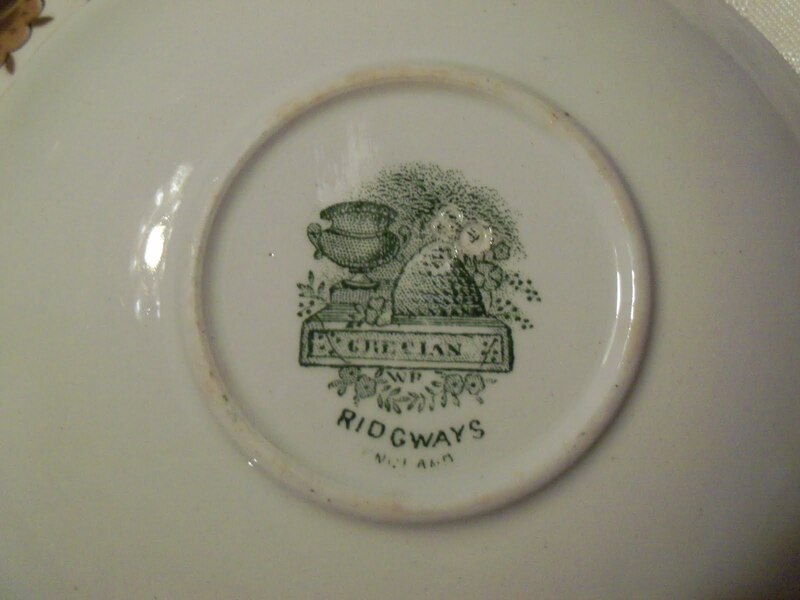 I got a set of 3 of these gorgeous Ridgeway saucers for a $1.00 last summer at a flea market. 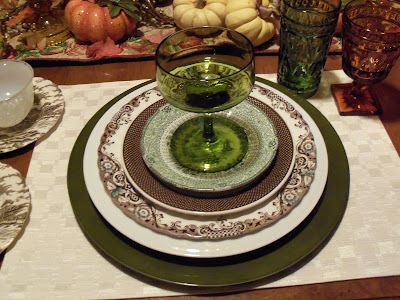 These pretty ironstone saucers came from a thrift store as well. I got 8 of them for $2.00. 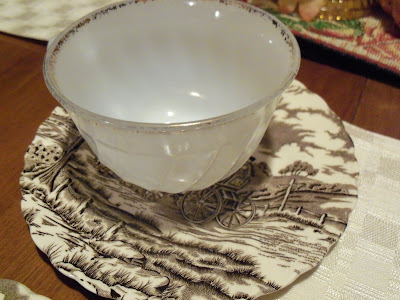 A vintage FireKing coffee cup. 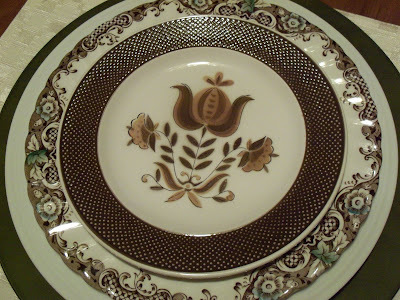 This was the princess's dinner plate since I only have 2 of the others. Cranberry salad and I tried a new stuffing dish this year. I will post the recipe tomorrow. 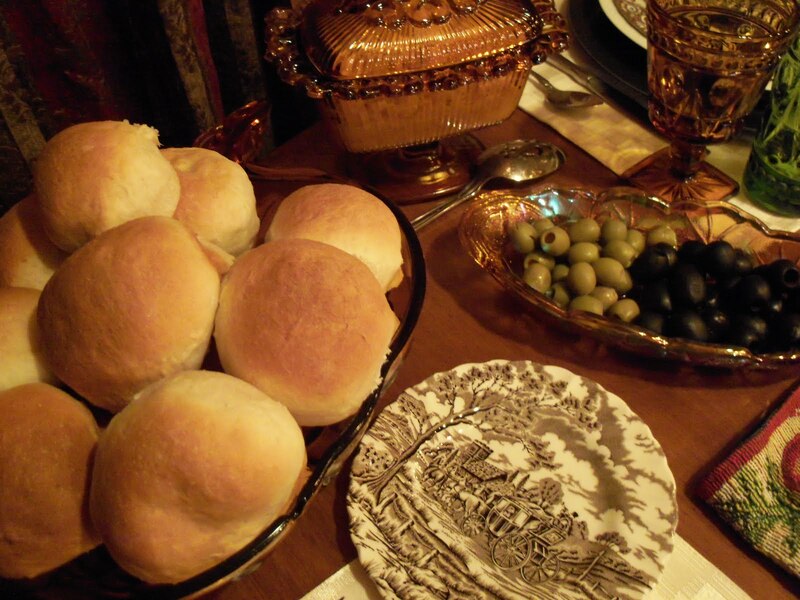 Homemade rolls, corn I cut off the cob last summer and froze and some olives. 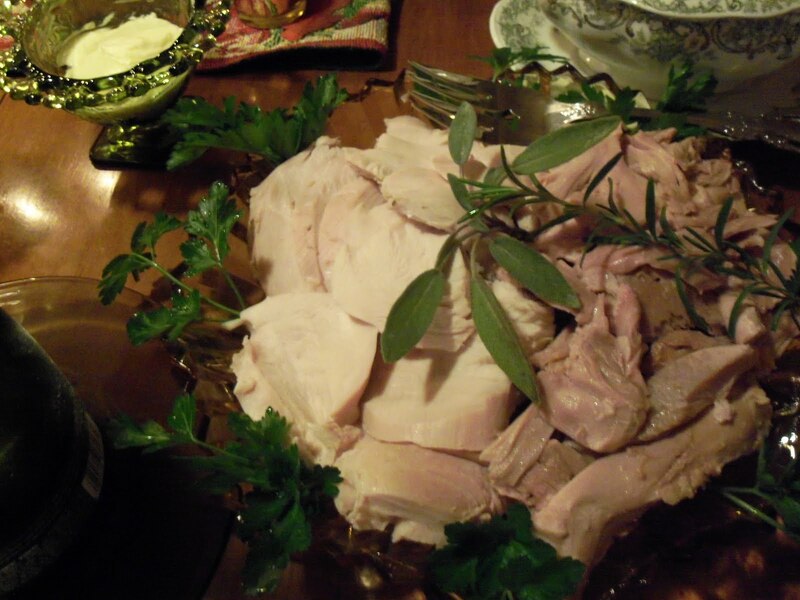 We brined our turkey 2 days ahead of time and I must say, that was without a doubt, the most moist and succulent turkey EVER! 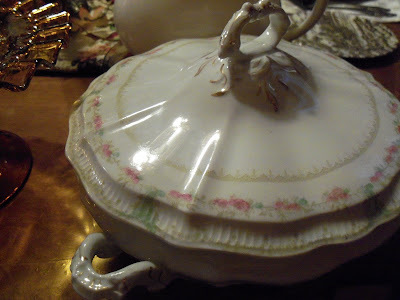 I got this beautiful old Johnson Bros. covered dish a couple of years ago for $1.00 at an antique mall. Why so cheap? Because one of the handles is broken off. 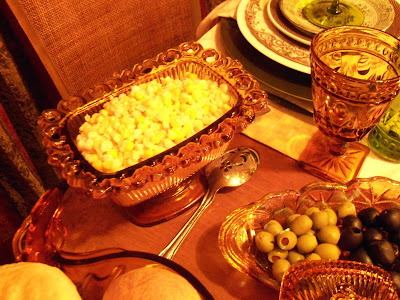 So, that was our Thanksgiving dinner. 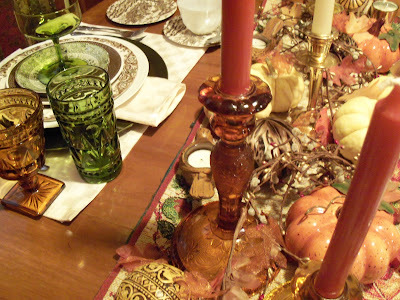 A wonderful meal, my loving hubby and beautiful little girl made for a blessed Thanksgiving! 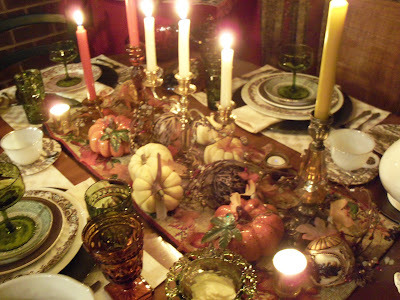 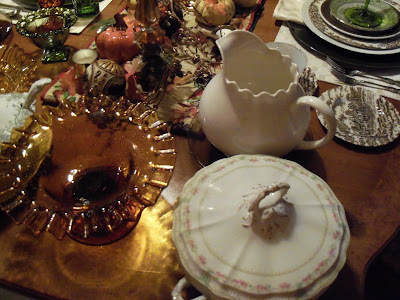 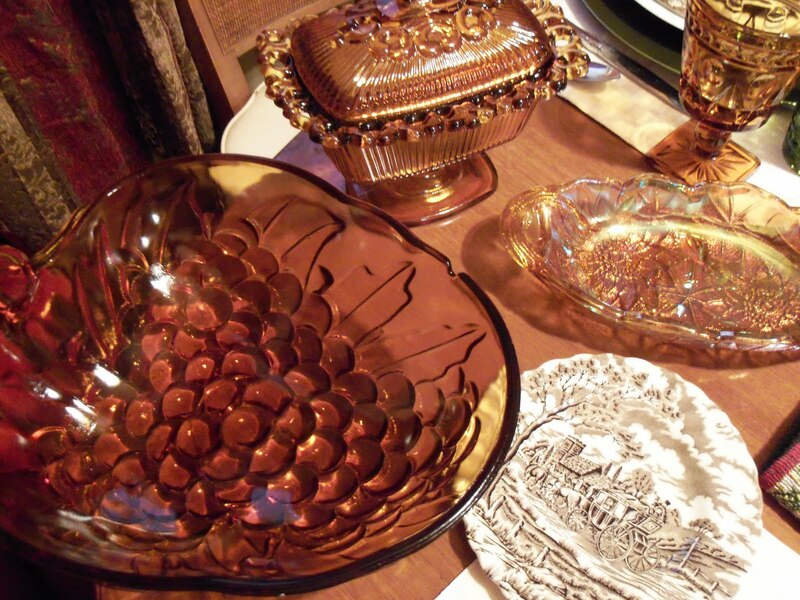 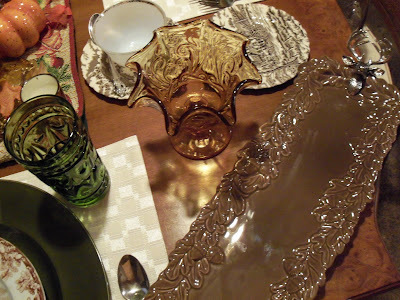 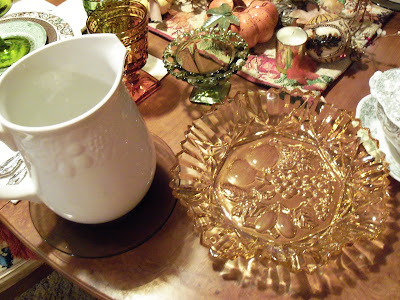 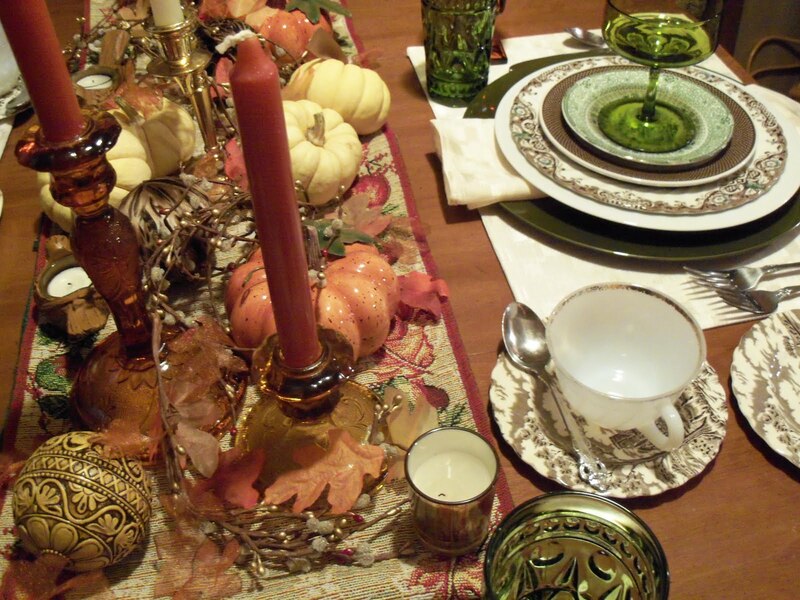 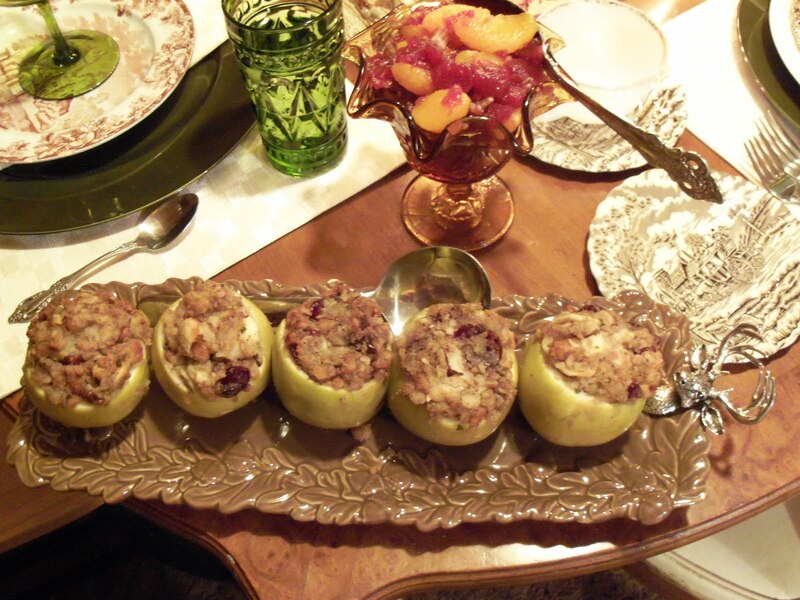 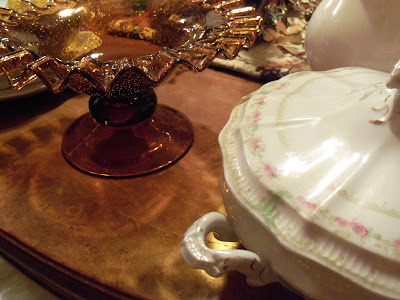 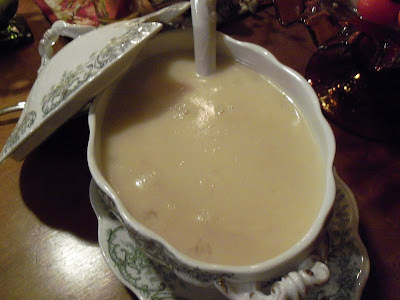 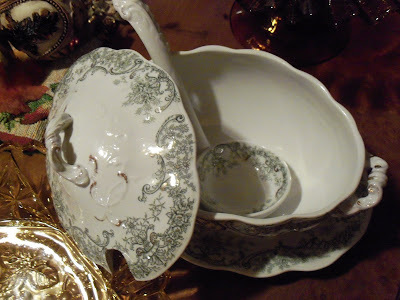 Beautiful table, Diann...I am still loving that little green tranferware tureen! 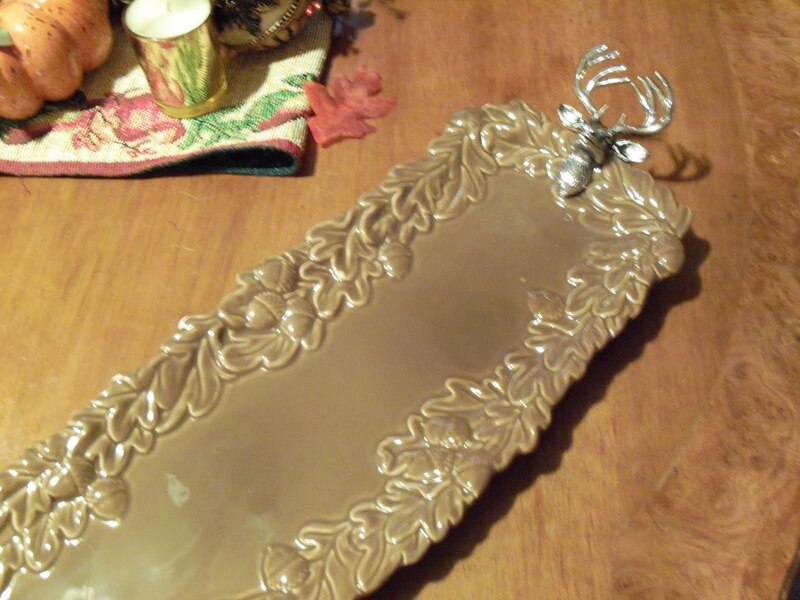 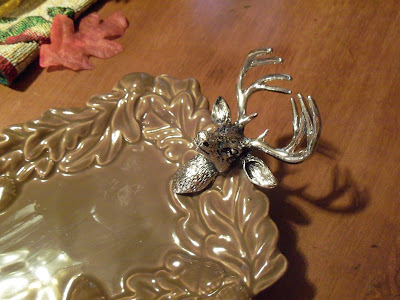 The tray with the deerhead/antler handles is great. Hope you are enjoying time with your family. What a beautiful table. 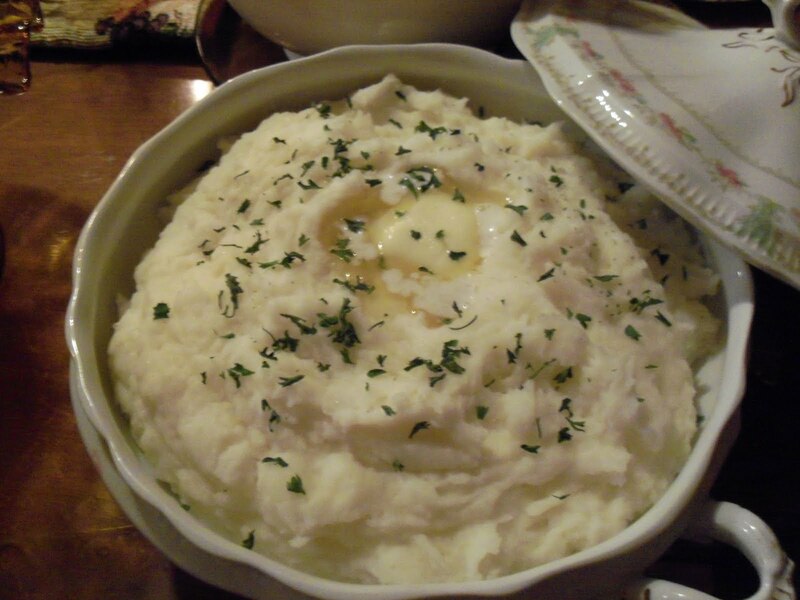 I can only hope mine looks half as good tomorrow. Happy Thanksgiving to you and your family Diann.